After installing the last Windows 10 1803 April Update, users began to complain about the incorrect operation of RemoteAPP applications published on RDS hosts running Windows Server 2012 R2 / Server 2016 (all servers have updated with the latest security patches). RemoteApp applications started to work much slower, any action that is caused by a mouse click is performed 2-3 times longer. Especially slowly the RemoteApp menus are displayed, which are called by right-clicking (menu items flicker, you have to click on them several times, and sometimes drop-down items in the menu do not appear at all). Windows 7 clients and older Windows 10 builds (1703, 1607) are working with RemoteApps normally. If the user connects to the desktop of the RDS host in full-screen mode via the RDP client, all applications and menus are displayed normally. Thus, in addition to the error CredSSP Encryption Oracle Remediation in May, our users also encountered poor performance of RemoteApp in Windows 10 1803. It turned out to be a hot month :). 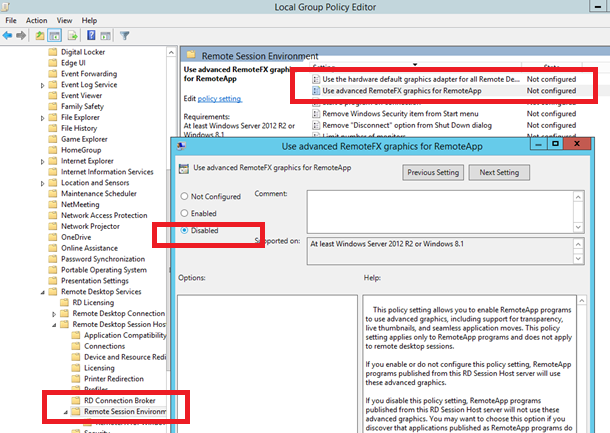 To work around this problem, you can try to change the value of thepolicy Use Advanced RemoteFX graphics for RemoteApp in the local GPO editor (gpedit.msc) to the Disabled state (GPO section: Computer Configuration -> Policies -> Administrative Templates -> Windows Components -> Remote Desktop Services -> Remote Desktop Session Host -> Remote Session Environment). If RDS servers publish graphics programs (usual, the CAD apps ) in the form of remoteapps, then they will not work without Remote FX support. 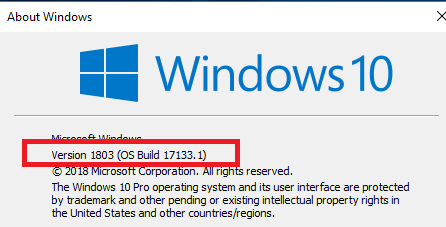 To fix the problem radically, you can roll back the current Windows build to the previous version (Recovery Options -> Get Started -> Go back to the previous version of Windows 10). After upgrading to Windows 10 1803, a new version of the RDP client appears in the system, which currently does not work correctly with applications published via RemoteApp. In April Update 2018, the mstsc.exe and mstscax.dll files were updated. However, there is also a workaround, which is to replace the RDP client version with an older one. Because performance issues with Remoteapp have been encountered also in Windows 10 1709, it’s best to use RDP libraries from 1607 or 1703. If you replace these files in the C:\Windows\System32 directory with the versions of the files from the previous build of Windows 10 (1703 or 1607), the problem with the performance of RemoteApp is gone. Close all RDP connections and running RemoteApp (it is better even to restart the computer)..
Download the archive with the versions of mstsc.exe and mstscax.dll from Windows 10 1607 (mstsc-w10-1607.zip). (In this example, the name of the local account with administrator permissions is root. Replace it with your account name). Replace the files in the C:\windows\system32\ directory with the files from the downloaded archive. This should restore the normal performance of your RemotApps. 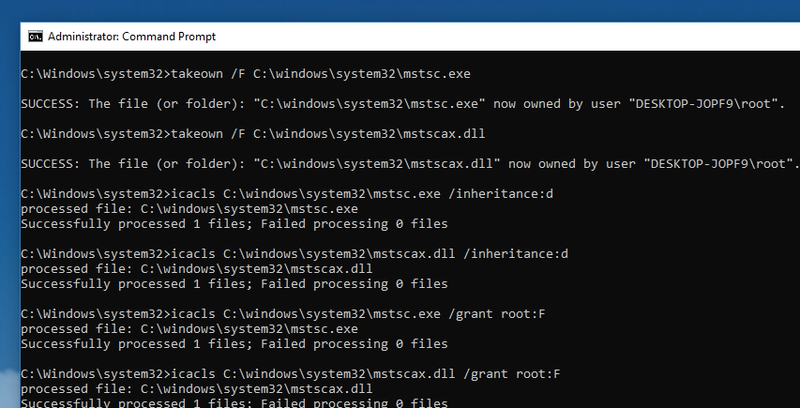 You can replace the mstsc.exe and mstscax.dll files on multiple computers in an Active Directory domain by using the startup scripts in the GPO. Thank you very much – this article leaded me to the right answer! Disabling RemoteFX did the trick – but – curious as I’m, I investigated further. RemoteFX is relaying on UDP as protokoll this is as far as I know the main difference (in network terms) using it. So i checked the IPS log of my firewall – seeing that it’s detecting an UdpFlood against my RDP Host.